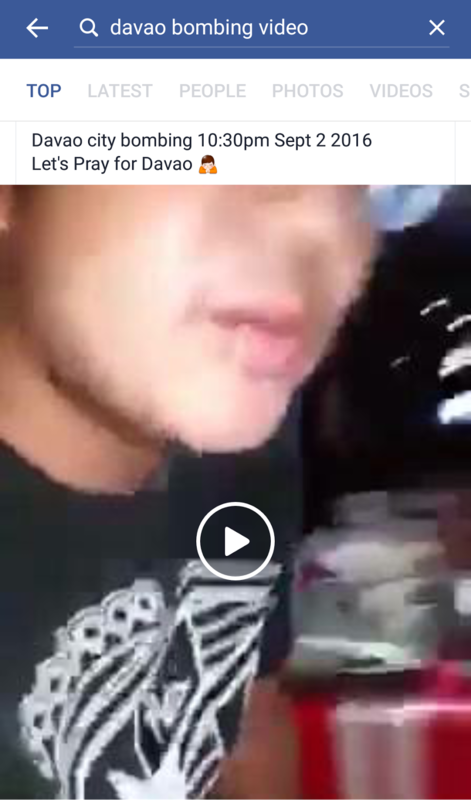 news about the Philippines that at least 14 people died and over 60 were injured in an explosion that happened last night at Davao City night market. Turkey etc., could also happen in our very own country, especially in Davao City, called as the safest city in the Philippines. sending out a strong message against President Rodrigo "Digong"
Duterte since Davao is his beloved city. But still, it was so wrong that many innocent people have lost their lives. Meanwhile, actual videos and pictures taken right after the bombing are everywhere in social media, particularly in Facebook. One of those is that video, an eyewitness account, shown in the screenshot below, where lifeless bodies are seen on the ground and many people crying. If you have a weak heart, don't ever try to watch those. Very heartbreaking. Can't imagine how their families were feeling upon seeing their loved ones lying lifelessly there.